A masterful presentation of Extra Sensory Perception wherein five different spectators prove their psychic ability. EFFECT: Five different Jumbo ESP symbol cards are exhibited, and one card each is sealed in a large manila envelope. The envelopes are mixed, so the whereabouts of any given symbol is unknown. Any five spectators volunteer, and name the envelope which they think contains a certain specified symbol card. Spectator's names are each written on an envelope, and their selection is recorded beside their name on a large white board or easel-mounted display card. Each envelope, as selected by spectator, and bearing spectator's name, is handed them, and opened by the spectators. In every case, each spectator has correctly selected the ESP symbol card within! The odds against this happening are an astounding 25,625 to 1! A fast, clean and awe-inspiring effect with a terrific impact. Only the five, unprepared ESP symbol cards are used, plus five large manila envelopes, and a white board or display card and easel stand are used. Full lecture is included, as are ready-to-print jumbo ESP symbol design cards. 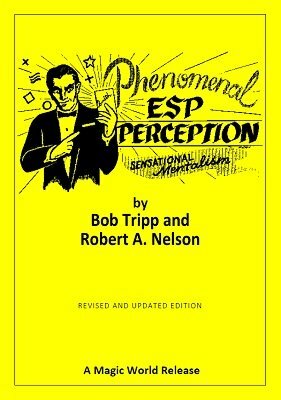 Phenomenal ESP Prediction is destined to be one of the all-time great demonstrations in psychic entertainment. Are you a Nelson collector? This effect was listed as No. 517 in the Nelson Enterprises catalog . 1st edition 1962, PDF 33 pages.